The Ashley Bryan Center is not a “bricks and mortar” institution. In close collaboration with Ashley, we are currently involved in the process of planning and organizing resources to fulfill our mission and goals. 1) The Ashley Bryan Storyteller Pavilion. This modest, free-standing meditative space, constructed on Ashley’s property on Little Cranberry Island, is the permanent home for Ashley’s breathtaking sea glass window panels. These works are so unique and exquisite, they have drawn visitors from around the world to Ashley’s home on his tiny island off the coast of Maine. 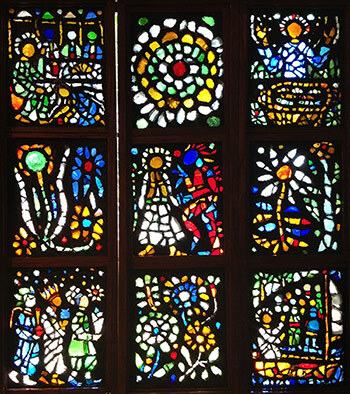 Examples of the sea glass panels included in A Visit with Ashley Bryan proved to be one of the most popular features of the Ashley Bryan Center’s inaugural exhibition. The Pavilion encompasses approximately 500 square feet, and it also includes space for the display of other works of art by Ashley on a rotating basis. Construction was completed in Spring of 2017, with The Storyteller Pavilion now open to the public. Hours are listed on our home page. 2) The Ashley Bryan Center/First Book Project. The Ashley Bryan Center is launching our first book distribution initiative in collaboration with Firstbook.org, a nonprofit organization, established to distribute books to underserved children in the United States. Our first distribution will involve a special publication of Ashley Bryan’s award winning Beautiful Blackbird. 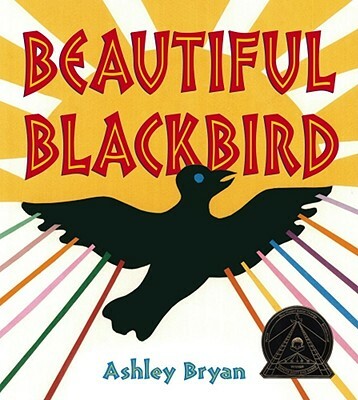 Simon and Schuster will print 5,000 copies of Beautiful Blackbird for this special edition with the Ashley Bryan Center logo displayed and a special introductory message to the children from Ashley. First Book will distribute copies of the book to children in Maine and New York through schools, libraries and organizations serving families. 3) The Ashley Bryan Center Archive Project. With the foundation of the Ashley Bryan Center, the extensive collections of art, manuscripts and other acquisitions amassed by Ashley Bryan over NINE decades has been entrusted to the Center for safe-keeping, study and future projects. The curatorial responsibility and opportunity that goes along with this stewardship is both the most exciting and most extensive of the tasks facing the Center. We are establishing a study center in Cambridge, MA, under the expert guidance of founding director, Nichols Clark (former curator and director of the Eric Carle Museum) to begin the exciting process of understanding, cataloging and planning for this extraordinary collection. 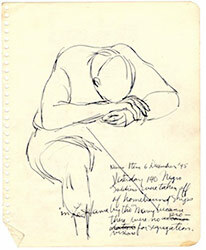 The Ashley Bryan Center Archive chronicles the artistic and cultural journey of our country through the visual and literary lens of Ashley’s life’s experiences—beginning with Ashley’s free WPA art classes during his childhood in the Bronx and his unique strategy for surviving the segregated US army in WWII as a young man, by chronicling his experiences in his sketchbooks.